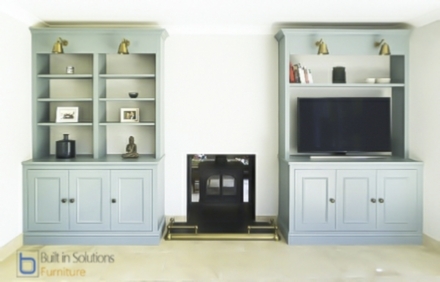 Instantly add character to your living room by having custom made alcove cupboards to go either side of your fireplace. 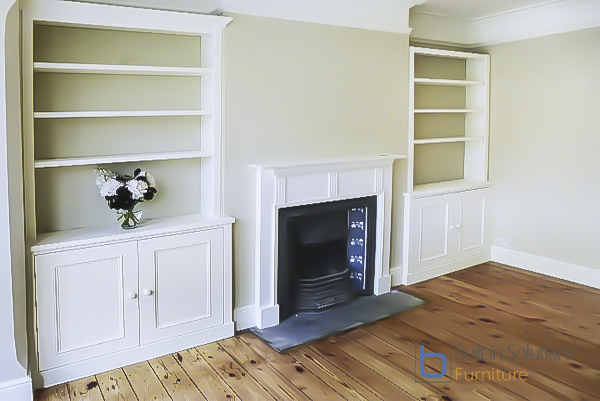 Built in cupboards in Alcoves make a fantastic addition to your home and create versatile living room storage that make your living room look great and provide a great storage solution. Create even more storage space by adding shelves in alcoves where you can have a place for photos of cherished ones, or just a display space. 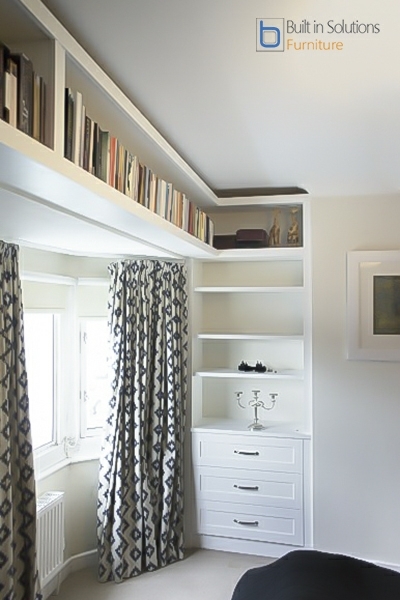 An alcove bookcase with adjustable shelves creates flexible storage to place books or an ornament. Made to measure, they will give you an amazing amount of storage that is functional, looks great and will certainly enhance your home. There are a few things to consider when designing your alcove cupboards so we’ve made a simple alcove design guide below. 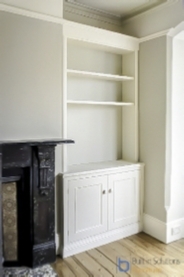 Alcove units in a traditional style fitted in to a Victorian home. Featuring strong wide span shelves, Beaded doors and moulded skirting and cornice. This pair of built in Victorian alcove cupboards were built around a fire opening. Finished in F&B Oval room with ornate features such as the large head section fitted with antique brass lamps. 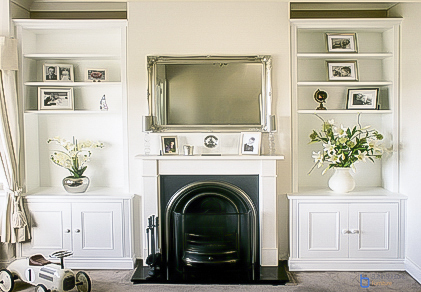 Clean lined Victorian alcove cupboards finished in a light ivory colour, and a panel bead within the recessed doors. The Cupboards that are fitted in this Victorian home, extend past the alcove with the bookcases recessed. 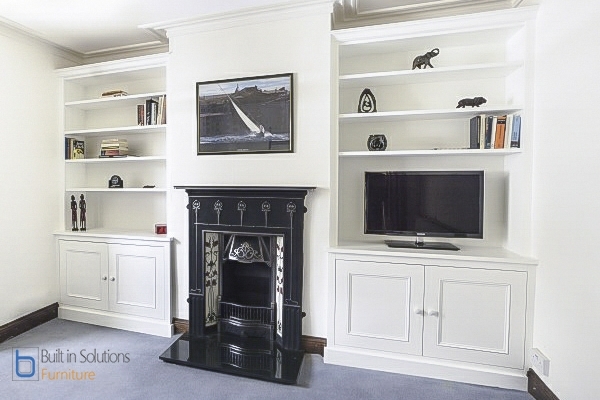 Complemented by the traditional looking Fire surround creating a beautiful room to relax in. 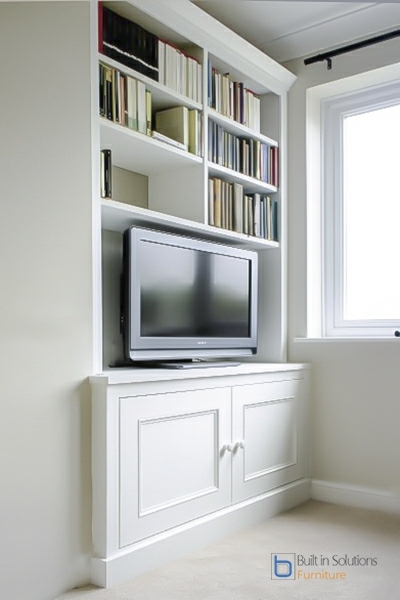 Bespoke alcove unit with traditional styled framed cabinet fitted up to ceiling. Moulded doors with a simple panel bead, Painted in White eggshell. Traditional Oak alcove unit with classic style kick board, other features include fluted pilasters and large panel bead in the door frames. A lovely addition to this room. 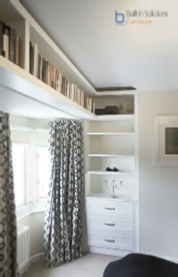 Fitted into a small bedroom, this built in alcove had a featured top bookcase that extends around the room with a three drawer section below the shelving. 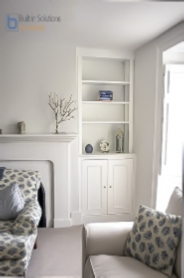 Modern styled alcove unit with panelled doors fits snugly into this unused corner in the room creating a feature and much required alcove storage. 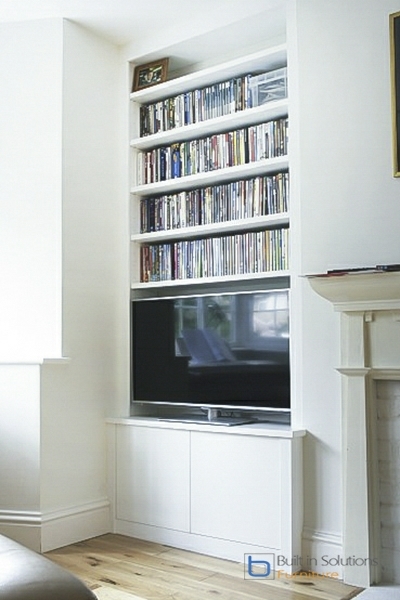 Contemporary Alcove unit with push to open doors and space for a LED TV. Fitted to the ceiling this piece just blends into the room with minimal fuss. 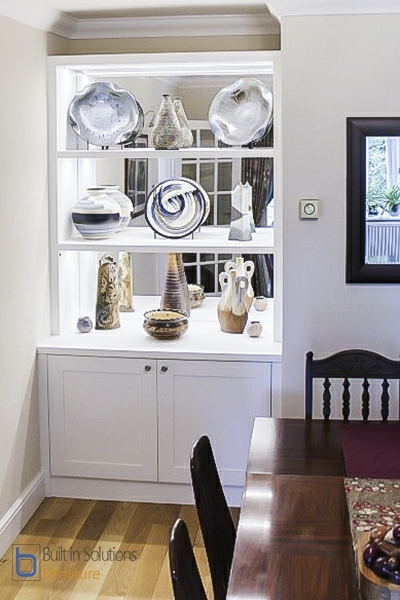 What is an Alcove Cupboard? 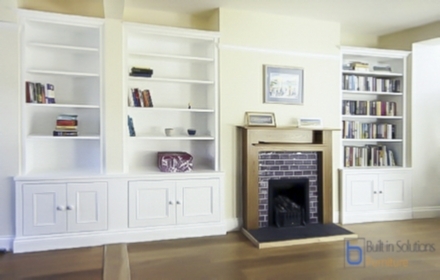 It is a type of cupboard that makes the use of the spaces either side of the fireplace. A number different bespoke furniture pieces can be created to make use of this space such as Floating shelves, Alcove bookcases and TV media Units. In your bedroom how would you like wardrobes in alcoves? Imagine all your clothes having a home of their own. Drawers for accessories, shelving for T shirts, Jumpers, and lots of hanging space with double hanging to maximise space. With every alcove furniture build, there are a several things that will require considerations to make it just right for you. There are no hard and fast rules that need to be followed, but think about proportions of how the cupboards and shelving look together and in your room. This is only a simple guide to point you in the right direction. Cupboard Height: Most Alcove cupboards are made to around 80cm which is standard sideboard height, this works well for most alcove cupboards. However you may want lower alcove cupboards to place a TV on them, or you need lots of storage space that can store your children’s toy boxes. Cupboard Depth: How deep should the alcoves be, well, what looks good is either flush to the front of the alcove or coming out a little. Around 5cm works well, little further may work, but try keep them from coming out past the fire surround or mantel piece. Bookcases & Shelving: Shelving and bookcases will look good either setback in to the alcove or coming out past the front of the alcove, but it really depends on the depth of the alcove, and what you want to place on the shelves. Backings: If your home is not exactly new, your walls are probably not very straight, with a bookcase placed against them you will see a gap where the straight bookcase is placed against the not so straight wall. Consider having backings, it will also make the furniture stronger. 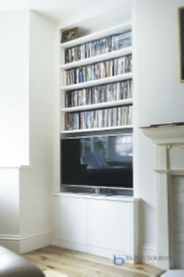 Television space: If your thinking about creating space for a Television, consider a TV bracket to mount the TV to the wall, cables can be neatly channelled way out of sight in to the cupboards where they can connect all the various Audio Visual items such as DVD player, Sky Box, Amplifier etc.....or simply, the TV can sit on the cupboard, below the first shelf. Lighting: For those who want to shine a light on their books, vase or other decorative pieces we can integrate LED lighting. These can be in a specific spot or in every shelf. Alternatively ‘up lighting’ above the top of the shelving creates a lovely soft light in your room. Display units: Add glass doors to the bookcase to show some extra attention for their favourite things, glass shelves and lighting to create the perfect display case or Display cabinet . Shelving strength: Is the shelving to be fitted up to the job? The wrong shelves will sag quite fast with a load, and look terrible. So think about having a stronger shelf material such as Birch Ply for the shelves.